Shopping-mall operator Taubman Centers announced yesterday its second-quarter dividend of $0.50 per share, the same rate it paid last quarter after raising the payout 8%, from $0.4625 per share. The board of directors said the quarterly dividend is payable on June 28 to the holders of record at the close of business on June 14. 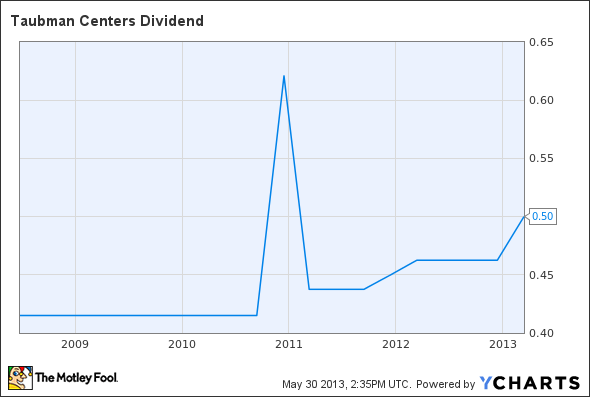 Taubman has paid a dividend every year since 1998, and it has steadily increased over that time period. The preferred dividends will be payable on June 28 to shareholders of record on June 14. The regular dividend payment equates to a $2.00-per-share annual dividend, yielding 2.4% based on the closing price of Taubman Centers' stock on May 29. The article Taubman Keeps Dividend Steady originally appeared on Fool.com.